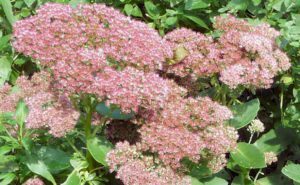 Its succulent, pastel green stems & thick waxy leaves appear suited to a hot climate, even a desert; but Sedum Spectabile survives icy winters. 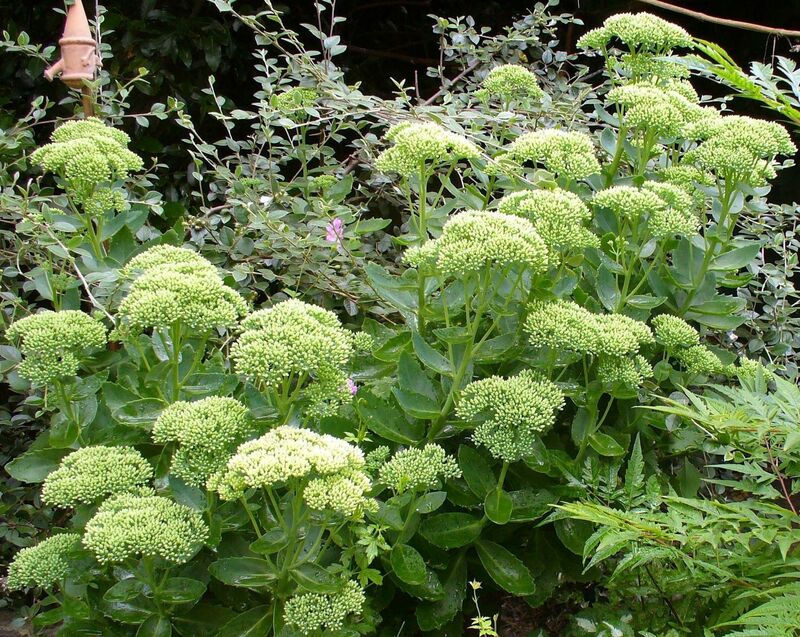 This hardy perennial likes full sun & soil that is well-drained, light or sandy. It does poorly in shade or wet ground. It grows to 35-40 cm, & its stems may need staking. 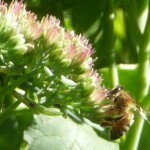 Sedum Spectabile is an important plant for bees. 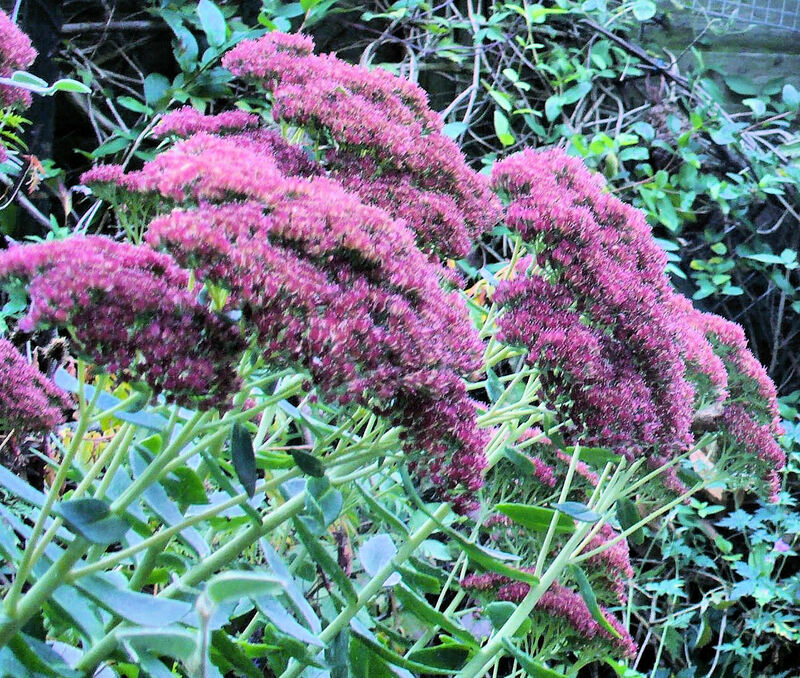 It is in bloom here in September and October, a time when Buddleia & other honey-rich flowers have gone over & there are fewer bee-friendly flowers. 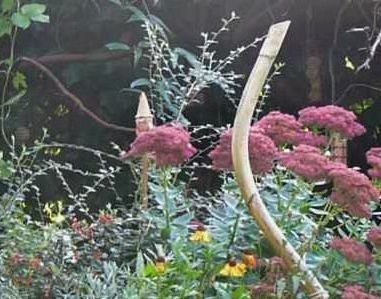 According to the Dave’s Garden website forum, cuttings or bits broken off can be stuck in earth & will grow. Although contributors from drier parts of Australia & USA are answering a query from the UK, it is worth any of us trying this method in a dry place. 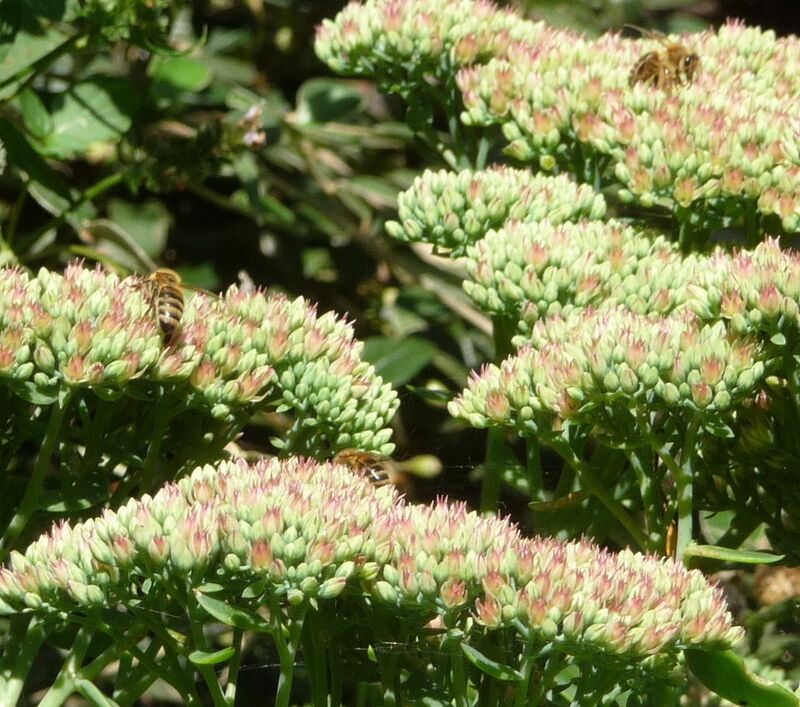 Scented flowers of Sedum Spectabile have the aroma of honey. 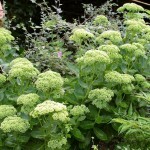 The flat flowerheads (corymbs) look like heads of PASTEL GREEN broccoli at first. 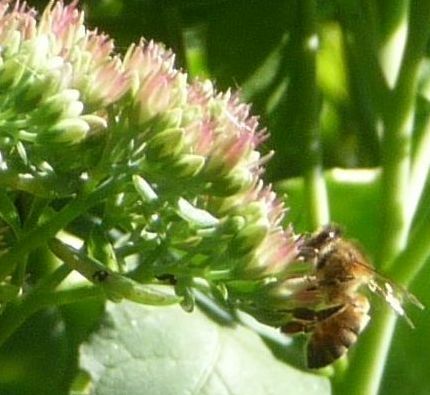 One flower at a time turns to a DUSTY PINK and CREAM; the Ice Plant is now at its most alluring to bees, who are all over it. 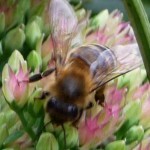 Gradually the corymbs change to a rich MAUVE, pleasing to the human eye but of no further interest to the bees. 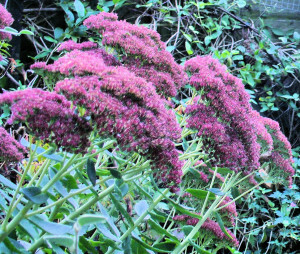 Flowers then deepen to a dark REDDISH-PURPLE, then a RUSTY BROWN. 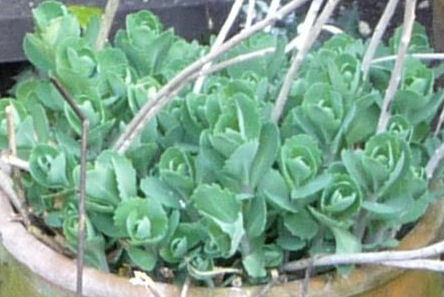 By December, new pastel green rosettes the size of marbles nestle at the base of the old plant, waiting for spring. 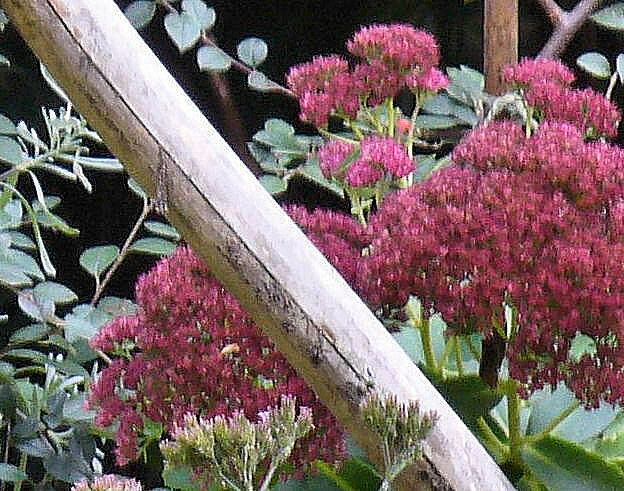 Our Sedum Spectabile grows in a terracotta pot, which has been moved about over the years. 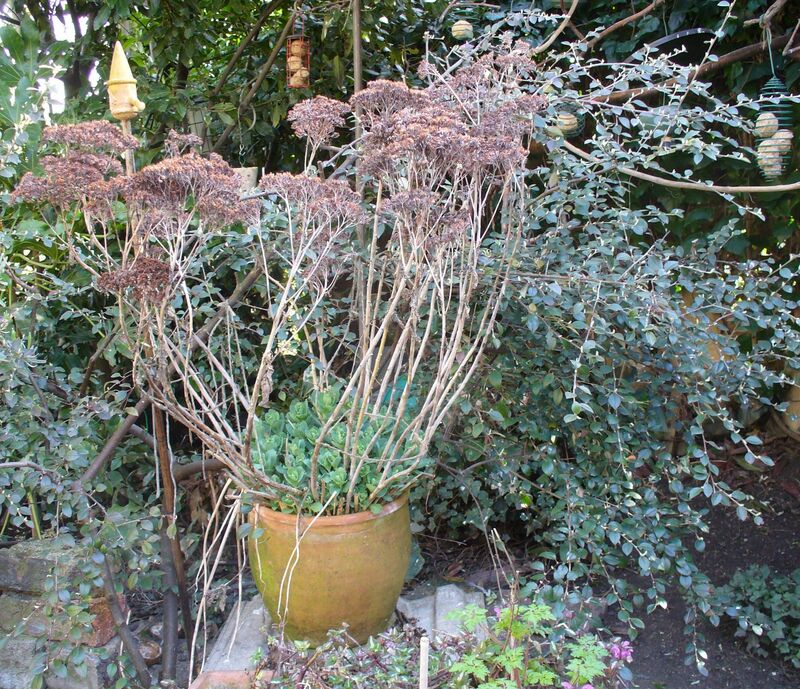 After the last flowers are over, we keep the dried stalks to remind us of how much space the plant needs when in flower. 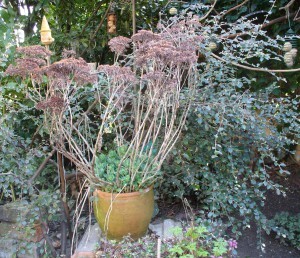 We can then allow for that space wherever the pot goes in the next growing season.